From Echternach, you drive to Scheidgen via Lauterborn. In Consdorf, you turn right to Berdorf. 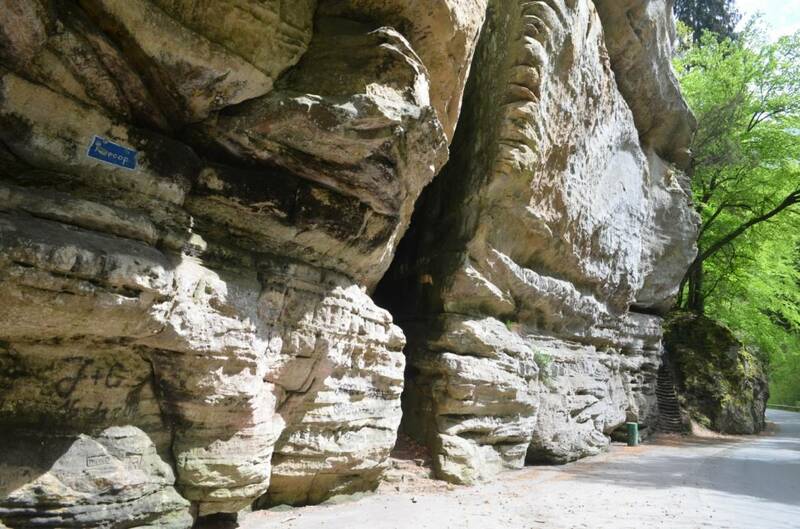 You drive through Berdorf to the parking lot at the Hohllay (Huel Lee) and walk 300m to the spectacular cave Huel Lee and to the Amphitheater. There you can see how millstones were carved out of the rocks. The millstones were once used in the numerous mills of the region. Back in Berdorf, you can visit the impressive 55m high Aquatower with its exciting exhibition about water. Then you drive to Müllerthal via Consdorf, where you visit the romantic waterfall Schiessentümpel (Parking: Heringer Millen, 1 Rue des Moulins, 6245 Mullerthal). Through the valley of the Black Ernz you drive to Grundhof. Before Grundhof, you take left up to Beaufort. We recommend a visit of the castle ruins and the Renaissance castle. You then drive to Dillingen, idyllically located in the valley of the Sûre. You turn right and drive along the Sûre via Grundhof and Bollendorf-Pont to Weilerbach, where a stop at Alfred Töpfer Bridge is recommended. There is also a memorial of the US veterans of World War II in Weilerbach. Go straight ahead back to Echternach.